Napoli head coach Carlo Ancelotti says he is surprised by the choice of Viktor Kassai for his side's Champions League clash against Liverpool. 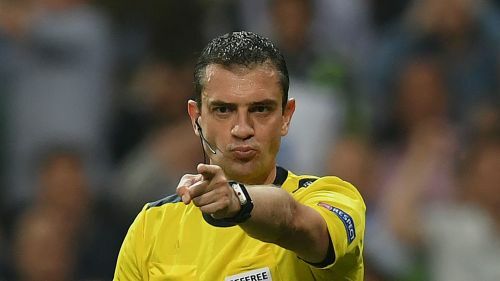 Kassai was criticised for a series of questionable decisions as Ancelotti's Bayern Munich were knocked out by Real Madrid in the quarter-finals last April. Arturo Vidal was harshly sent off by the Hungarian referee, while two goals scored by Cristiano Ronaldo appeared to be offside. Following Bayern's exit Robert Lewandowski claimed Kassai's calls made it "impossible" for the Bundesliga giants to beat Madrid, while Vidal blasted the official as a "clown". "I'm surprised with the appointment because we had a bad experience when I was in charge of Bayern," he said at a news conference. "It wasn't that long ago either. Time usually heals all wounds, but it doesn't make you forget about them…"
Jurgen Klopp's Liverpool thrashed Napoli 5-0 in a pre-season friendly but Ancelotti does not think that result will have a bearing on his team. "That was a friendly so we didn't have a specific strategy as it was just a run-out," he added. "There wouldn't have been any point in getting tactical because at that time the team was just trying to build fitness. We definitely can't play the way we did in that game, but obviously it will be completely different tomorrow. "Liverpool don't just have one good player – they've got several, especially when it comes to playing on the break. We want to attack and win but we need to be wary of that side of Liverpool. "Klopp is a friend. He's a very experienced coach and his teams have a very clear identity: pace, aggression and intensity. "Liverpool will play with very high intensity so we'll need to be ready for that. It's important that we show bravery and personality, implement what we've worked on and be ready to withstand their counter-attacks. If we play the way we know how, we can cause Liverpool problems."